NYC DOT has extended its interim improvements for the greenway along Flushing Avenue from Williamsburg Street to Navy Street. It features a physically protected 2-way bikeway from Williamsburg Street West to Washington Avenue and new Class 2 bike lanes for the balance of the stretch. Combined with previously created interim segments on Kent Avenue, Williamsburg Street West and Columbia Street, nearly 4 miles of the 14-mile greenway route have been created on an interim basis. In the meantime BGI continues to work with NYC DOT on the the master plan for the entire route. 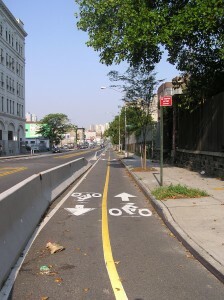 New Flushing Ave interim greenway treatment installed this month by NYC DOT.